Proposals are mini-estimates that provide a preview of a job for a client. It lets you provide a clear, concise proposal of the work you are offering without opening an actual job ticket. Proposals are a starting place to organize important details before the client starts the work. Proposals can be added when pitching an idea to a client (or prospective client, too). Once your bid is accepted, they can be easily converted into job tickets. With a creative brief, cost, and start and due dates, you can pinpoint exactly what resources are needed to get the job done. The printed proposal looks like the combination of a job ticket report and creative brief. It doesn't get a job number, but each proposal is numbered automatically in sequence. A proposal gets its creative brief from a user-selected job type/spec sheet when the proposal is added. 1 Choose Production > Proposals. The Proposals window opens, prompting you to enter a client number. 2 Enter a client number, or enter the word "ALL", then click the Show button. Clients & Profits X then lists all of the proposals for the client number you entered. Proposals are sorted sequentially (oldest first) by client number. For each proposal you'll see the client number, ID, name/description, type (which is based on job type/spec sheets), budget, and current status. Clicking the next or previous buttons to select the next or previously displayed proposals. You can sort proposals by clicking on a column heading. The sort direction (i.e., ascending or descending) can be changed by clicking on the up/down arrow. When you select a proposal, its description appears, giving more detail about the job. Double-clicking on the proposal opens the edit proposal window so you can view the full description, creative brief, contact, and other details. Proposals have one of three statuses: pending, killed, or approved. All new proposals are pending by default. Approving a proposal converts it into a job ticket, changing the proposal's status to approved. If the client turns down the proposal, clicking the kill button changes its status to killed. The "show status" pop-up menu can be used to filter the proposal list to show only pending, approved or killed proposals. Use the windows toolbar buttons to add, clone, edit, and delete proposals. Clicking on a button is the equivalent to choosing a menu command. New proposals can be added for existing clients or prospective clients -- as long as they have an account in the Clients data file. Click here for step-by-step instructions. An existing proposal can be duplicated, or cloned, into a new proposal for the same client or a different client. Once a proposal is cloned, it can be modified as needed. An original proposal can be cloned any number of times. 1 Click on a proposal to select it. 2 Click the clone button then follow the steps for adding a proposal. An existing proposal can be edited and reprinted any number of times -- whatever's needed to convince the client to approve the work. An approved proposal can't be edited. 2 Click the edit button then follow the steps for adding a proposal. The print proposal button prints a hard-copy version of the selected proposal (which looks like a job estimate). A proposal can be printed whether it has been approved or not. Clicking the approve button automatically creates a job ticket from the selected proposal. When the proposal becomes a job, the proposals name becomes the jobs name, and its description becomes the jobs description. 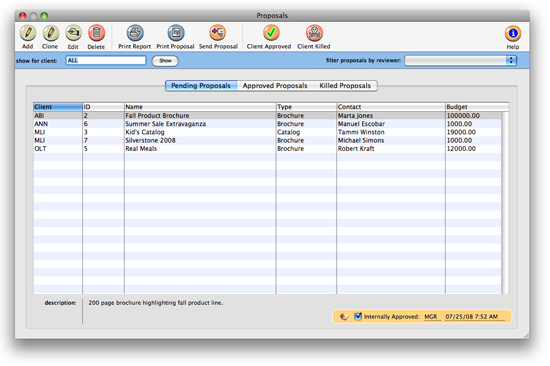 Several proposals can be approved at one time by using your mouse to select multiple proposals. Any staff member with the access privileges to open jobs can approve a proposal, even if they didn't add it themselves. Proposals can only be approved for active clients. If a proposal was created for an inactive client or prospective client, you'll need to first make the account "active" in the Clients window then approve the proposal. Also, proposals can't be approved if the client is on credit hold. 2 Click on the approve button. An approved proposal can't be unapproved. Instead, the job created by the approved proposal can be canceled. Clicking the kill button effectively cancels the proposal. Clients & Profits saves the killed proposal for future reference, but it can't be converted into a job ticket. An approved proposal can't be killed. Several proposals can be killed at one time by using your mouse to choose two or more proposals. 2 Click on the kill button. A killed proposal can still be approved later should the client change its mind. A proposal list can be printed showing the proposals that are currently displayed in the Proposals window. 1 Find the proposals you wish to print.